Israeli occupation bulldozers demolished, on Tuesday morning, two flats in a building located in the Shu’fat neighborhood, north of occupied Jerusalem, under the pretext of improper licensing. Palestinian resident Suliman al-Muhtaseb said, according to Al Ray Palestinian Media Agency, that he was surprised by Israeli soldiers who surrounded the five-story building, preventing him from reaching it, and then assaulting him by pushing and beating him on the face, and removing him from the place before starting the demolition. Suliman explained that he is now forced to pay more than 70 thousand shekels to the Israeli municipality, for the costs of demolishing the apartments, in addition to the cost of removing the rubble. He added that Jerusalem Municipality employees attended the construction of the building, for the last and fifth floor of brick and granite, asking him to stop building, whereupon he responded to their request. 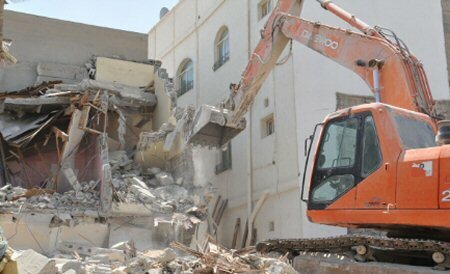 After this, he went to the Israeli municipality in Jerusalem, who asked him to demolish the apartments himself. He demolished part of it and then applied for a permit for the two apartments.